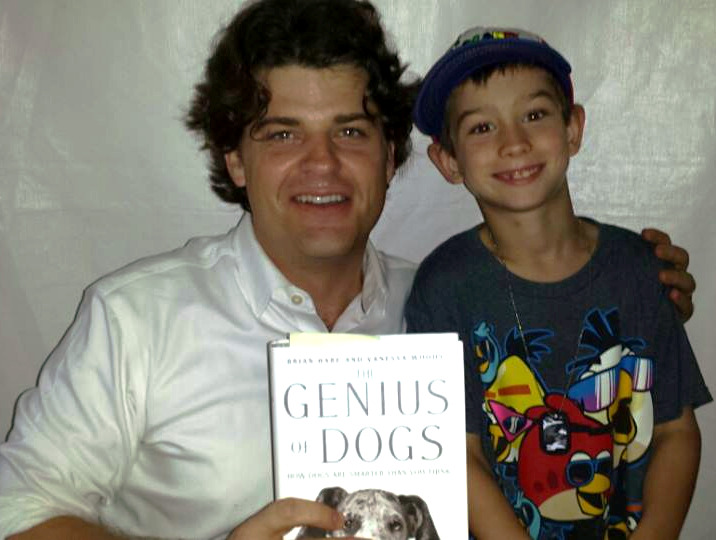 Brian signs our copy of The Genius of Dogs during the 2013 Decatur Book Festival. Ever wondered how smart your dog is? As a proud owner of a rambunctious golden doodle, I have, and that’s why my family and I stopped by Brian Hare’s recent appearance at the Decatur Book Festival, where we heard him present and received an autographed copy of his 2013 book, The Genius of Dogs. Brian, an associate professor in Duke University’s Department of Evolutionary Anthropology, co-wrote the book with his wife, Vanessa Woods, a research scientist in Duke’s Department of Evolutionary Anthropology and an award-winning journalist. According to a 2010 interview in The New York Times, they met in 2004 when Vanessa was volunteering at a chimp sanctuary in Uganda. Brian was there, examining chimpanzees’ capacity for cooperation and sharing. He was invited to continue his work in the Congo with bonobos, humanity’s closest ape relations and unique in the animal kingdom for not killing one another. Newly engaged, the couple went to the Congo as a research team, and the culmination of that adventure was Bonobo Handshake: A Memoir of Love and Adventure in the Congo, named to Scientific American’s Top 10 books for June 2010 and recipient of the Society of American Travel Writers Lowell Thomas Award 2011. 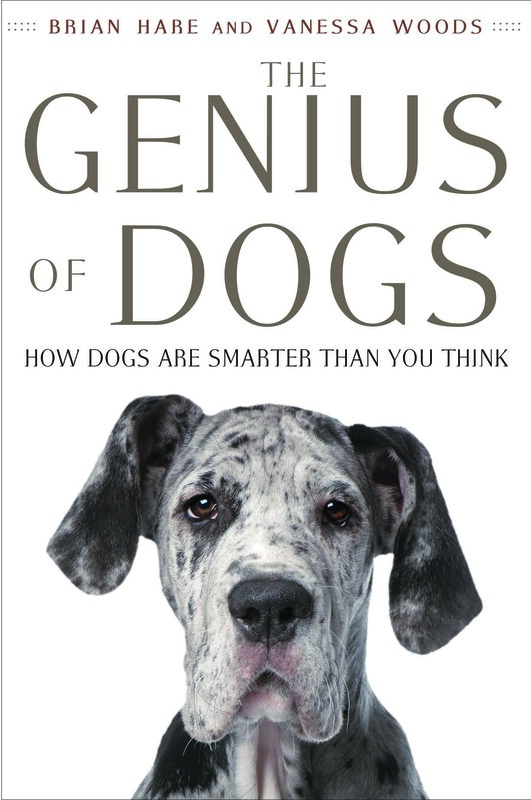 Two years in the making, The Genius of Dogs included reviewing more than a thousand studies. 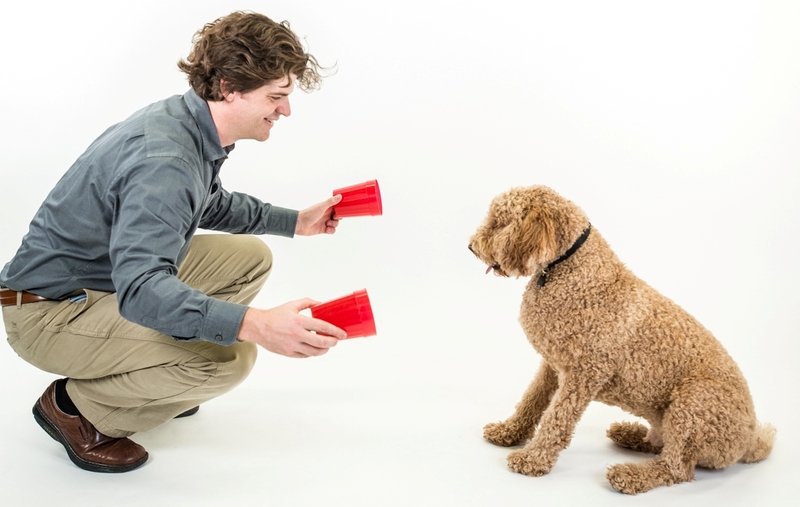 It pulls from research at the Duke Canine Cognition Center, which Brian founded to better understand the flexibility and limitations of dog cognition. The couple work at the center together — a place that “offers the cheapest tuition and best acceptance rate at Duke,” they joke on the website. Recently, Brian and Vanessa joined other experts in dog cognition to launch Dognition.com, a website that thousands of dog owners have accessed for a fee to download tools to measure the intelligence of their dogs, who are “astoundingly good at reading our gestures and learning words,” Brian told WIRED science writer Greg Miller in a feature published in February 2013. Dog owners report their results online, which gives researchers like Brian broad-based data to better understand and help dogs. Today, The Writing Well asked Vanessa and Brian to share highlights of their writing collaboration and what they hope comes from their work in dog cognition summarized so well in their book. Q. What prompted you to write The Genius of Dogs? What makes this book unique in the literature of animal intelligence/cognition? Never has there been a more exciting time for dog lovers. The research over the last decade has been so exciting that we want to share it with everyone. Before now, there has not been one place where people can find out the latest in dog research – they would have to rely on media reports or read the scientific papers. We wanted to synthesize the research and organize it in a way that people could get the most out of it. Also, although there are a lot of dog lovers, most people don’t realize how important dogs have been for thinking about our own evolution, and how we became humans. We wanted people to know that their best friends are not just cute pets, they are part of a much bigger picture. Dogs may help us understand ourselves. Most of all, we wanted to give dogs credit. They have developed their own unique genius that is unparalleled by any other animal on the planet. Finding out how dogs got their smarts has been a fascinating journey, one that we want to share. We hope both ends of the leash will benefit from what we’ve discovered. Q. This was a collaboration between two scientists who happen to be husband and wife — how did you complement one another? Brian’s strength is definitely the science, while Vanessa’s is writing about the science in an entertaining manner. Our editor did not know how a married couple could write a book together (and whether we would survive). Jimmy and Rosalynn Carter famously said writing a book together almost ruined their marriage. The biggest conflict we had was Brian’s love for superfluous adjectives and Vanessa’s delight in deleting large sections of Brian’s work. We tried sitting together and writing, but that didn’t work. Eventually we came to an arrangement where even though we were both using the same computer and working on the same chapters, we were never at the computer at the same time, and we would email the versions back and forth. As to if we would do it again? Ask us in five years. Q. What one finding from your book surprised each of you the most? Brian: While we are occasionally advised to be the ‘top dog’ and dominate our dogs in order to win respect and obedience, it seems that dogs don’t follow a leader who acts like the big bad wolf. While some feral dog groups (dogs who live without human interference) have a dominance hierarchy that predicts priority to resources such as food and mating partners, this hierarchy is not as strict as in wolves. In feral dogs, the pack does not follow the most dominant dog, instead they follow the dog with the most friends. Vanessa: It’s a battle that’s been raging since Garfield first pushed Odie off a counter top – how could dogs possibly be smarter than superior felines? Crafty as cats may be, they have yet to out- compete a dog in a cognitive experiment. As one example, a dog or a cat watched while an experimenter hid a reward in one of four boxes. Dogs remembered where the food was for four times longer than cats. But dog owners shouldn’t be too smug. Dogs were outsmarted on a similar memory problem by rats. Our family dog, Missy, the newest recruit for Dognition. Q. What do you hope happens as a result of your book’s publication? 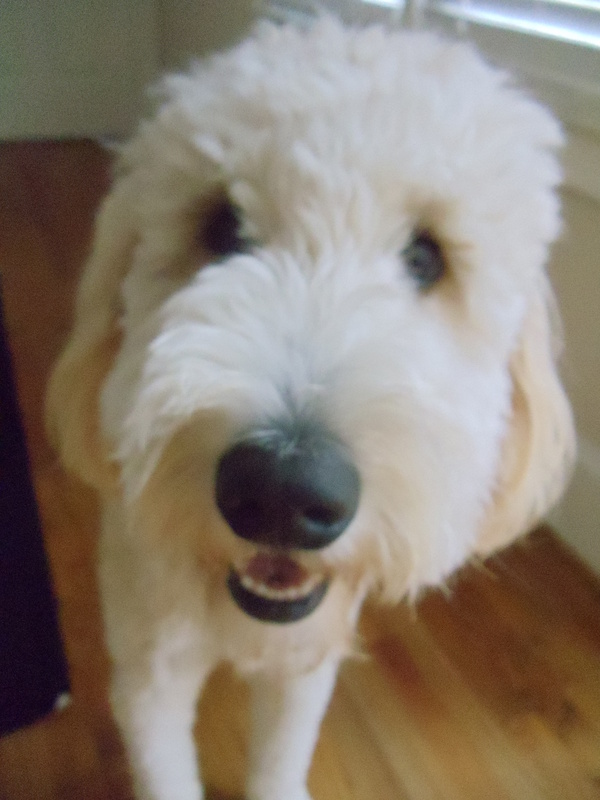 One of the most important things we hope people take away is that their dog is cognitive. This means they aren’t mindless learning machines, or slaves to our every whim. Dogs have the ability to flexibly and spontaneously make inferences, something far more impressive than a trained trick. Some people might get frustrated with their dog’s disobedience. We hope after reading our book, that they might realize that sometimes it is because their dog is too smart, not too stupid to obey them. Also, we hope they take away that there is not just one type of intelligence. We hope that people will be motivated to find their dog’s unique intelligence, and perhaps their own unique intelligence. What is true for dogs should be true for people too. Most of all, people should know that is their dog is a genius! 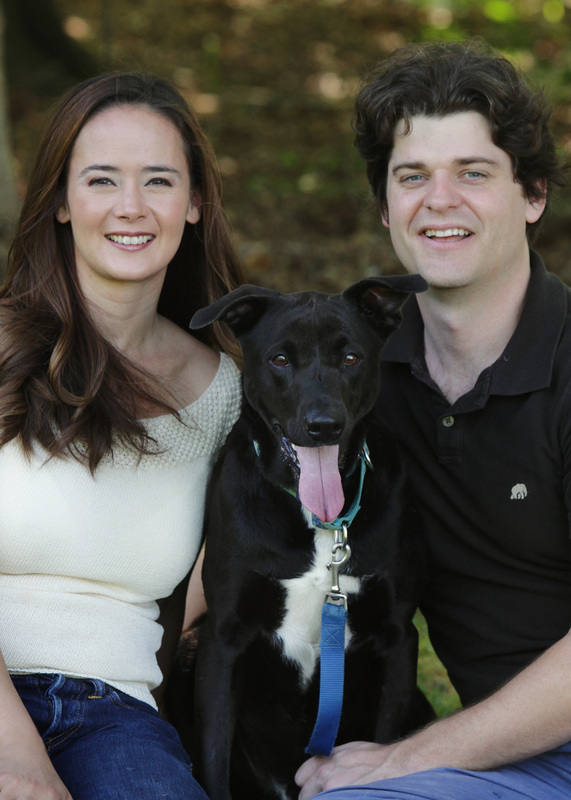 To learn more about Brian and Vanessa’s work understanding man’s best friend, visit the Dognition website. This entry was posted in Author Interviews, Inspiration, Writing Conferences and tagged Brian Hare, Dognition, Duke Canine Cognition Center, The Genius of Dogs, Vanessa Woods on September 23, 2013 by AnneWainscott.